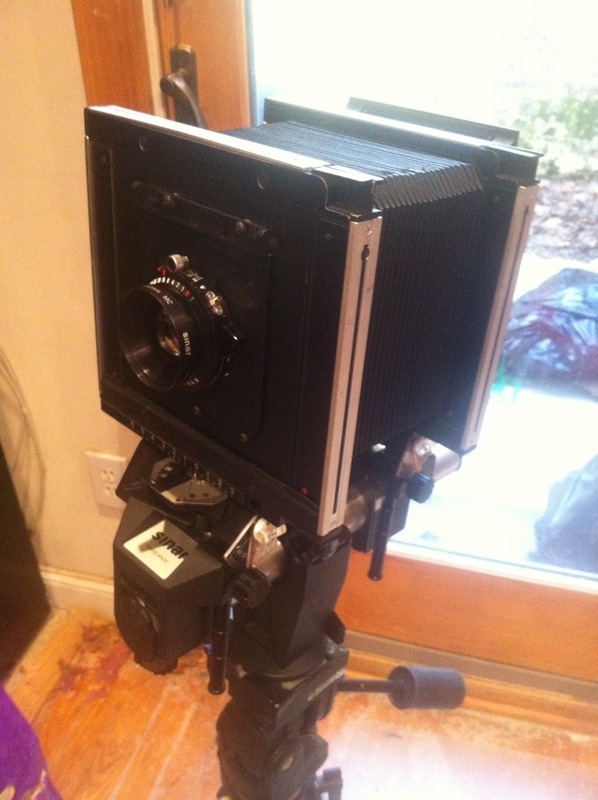 I got my new teaching tool for my Introduction to Large Format photography class. It’s a Sinar F 4×5. Sinar cameras were the first modular large format system with standardized components that would let you build 4×5, 5×7 and 8×10 cameras on a common architecture. While the F has certain limitations (base tilts, friction driven movements), its a fantastic entry-level camera and very light-weight for a studio monorail camera (about 7lbs). I got the camera at KEH Camera online. They have a very limited selection in inventory at any one moment, but their prices are excellent. The Sinar F is a good starter camera and one I highly recommend for students looking to get started in large format. There are lots of other good cameras, of course, and it all depends on what you need from your camera – for some people, a field camera may be a better solution. My primary large format camera is a Canham field camera because I like to travel with it, but it has it’s own limitations (fixed bellows length, limited movements). I’ll cover all the quirks of large format cameras in the class, so to learn more, sign up!